For a while now, I've wanted to know what the depth of the Nether is. I might've been able to just look it up (which I kind of did, but the wiki alone didn't say anything), but that wouldn't have been fun. So I made like Thanos and did it myself. Note: I was using the term "surface area" incorrectly so I changed it to "surface distance". So let's say we have a new default, vanilla, unaltered world. Its coordinates stretch, from its center, 29,999,984 blocks in all four directions. It's been stated that 1 block equals 1 meter. So that's 29,999,984 meters, and if you divide that by 1,000 you get 29,999.984 kilometers. Now, the important part: Let's say that this world ends at the world border. Technically a Minecraft world is infinite, but the space in which you can explore and build is finite. We'll also say the world is 2 dimensional and that it wraps around like a real planet. 29,999.984 km is the surface distance of only half this 2D planet. Multiply it by two, and you have 59,999.968 kilometers of total surface distance. For now, I'll leave that number alone. Every 1 block in the Nether is 8 blocks on the Overworld. That means that the Overworld's surface distance is the Nether's surface distance, but 8 times larger. And yes, the Nether in actual Minecraft is just as big as the Overworld, but that's a math problem for some other time. I've been learning dilations in my Geometry class recently and so here's the perfect time to use them. I'll cut out a quarter chunk of the Nether and scale it up 8 times. Now you can see how deep the Nether really is. But we don't actually know the exact number yet. 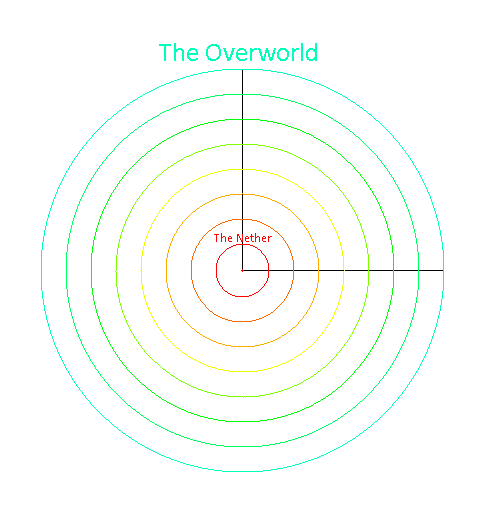 The top layer of this diagram is the Overworld-- the Nether's surface distance times eight, like I said before. That means that the Overworld's surface distance for this fourth of a planet is 14,999.992 kilometers. That number isn't actually important, though. What is important is learning what the radius of this Minecraft world is from the center. The formula for finding a circle's radius is circumference* ÷ 2π. Circumference is the same thing as surface distance, therefore 59,999.968 ÷ 2π = ~19,098.582985111082410964562396141. I'll shorten that down to 19,098.582. That, in kilometers, is our distance from the very center of this world to the Overworld's bedrock layer. 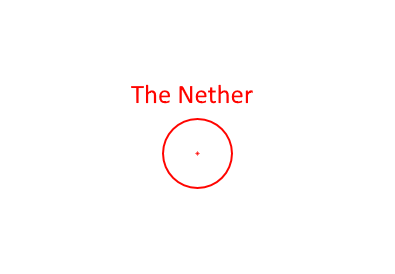 You can see in the above image that the Nether takes up an eighth of the planet's depth from the surface to the center. That means the distance from the core that the Nether is at is an eighth of the planet's radius, which is 19,098.582 kilometers, and that its distance from the surface is seven eighths of the planet's radius. Remember when apples were a rare item? I do. To get this to work you'd have to assume that every block in the Nether is 1/8 of a meter and that the player shrinks to 1/8 of their size when teleporting to the Nether which, while weird, could be the case. Also, you should check how portals connect to the Overworld when placed outside the central 64:th of the Nether's area, that is more than 1/8 of the way from the center to the edge, and try to work an explanation of that into your model. But the fatal flaw in your calculations is the introduction of this mythical thing you call a "circle", there's no such thing in (MC) reality. And, PLEASE, learn the difference between distance and surface area! The distance across the world is 60,000,000 meters (I think you're forgetting the chunks outside the barrier but inside the hard limit, you can teleport there if you have cheats enabled) and the surface area is 60,000,000 X 60,000,000 = 3,600,000,000,000,000 square meters or 3,600,000,000 square kilometers. To me, the Nether is just bellow the Overworld. You could argue that it is a series of blocks that is laid out in such a pattern that it approaches a circle, and thus the formulas approach the use of π. You could also argue that round things in Minecraft are never perfectly round because they are also never perfectly round in the real world. In fact, we have a 'roundest object' that's not perfectly round. I'm sure that this video has ended up in your YouTube feed more than once. In which case, the parallels between Minecraft and the real world are close enough that this is a non-issue. It's fine if OP is talking about a strip of one block wide. It would be a surface area of 60.000.000 m * 1 m = 60.000.000 m2. Minecraft, in reality, is flat. And so is the Nether. It's implied that the Nether exists under the Overworld, so for the 1:8 block ratio to work, it would have to follow the rules of a spherical planet. It's just that it's not actually spherical. It just somehow works. That's also why I used a circular diagram. I haven't actually tried that thing with the portals, though. If you travel eight blocks in the Overworld, does that equal to eight blocks in the Nether, or does it shrink down to one? I haven't messed with that enough to remember. This assumes that the world ends at the barrier. I also did use the term "surface area" incorrectly, because "area" refers to a plane. I wanted to use the word "surface" because that's where the Overworld is. I kind of forgot that I could probably just use variables instead. Minecraft, in reality, is flat. And so is the Nether. It's implied that the Nether exists under the Overworld, so for the 1:8 block ratio to work, it would have to follow the rules of a spherical planet. You could have a cone with the Overworld and Nether as flat surfaces with the Overworld 8 times as far from the point. Though that gives us no way to judge the distance between the worlds because we don't know the angle of the cone. That doesn't entirely work either because then you'd expect the ratio to be greater than 1:8 when going between the top of the Overworld and the bottom of the Nether and smaller than 1:8 when going between the bottom of the Overworld and the top of the Nether. Though maybe that isn't a problem since the portal is _trying_ to connect to a point at the same height in the other world, so you could say it sends you diagonally to a point at the same height in the other world and then straight up/down to the actual portal. I think the ratio would still be somewhat greater when going between the bottoms of both worlds than when going between the tops. That could be fixed by saying that you are ported straight down from the first portal to Y=0, then diagonally to Y=0 in the other world and finally straight up to the second portal. Of course the math of connecting portals is simpler assuming spherical shells but then you have to explain why the blocks aren't larger in the Overworld then in the Nether (and larger at the top of a world than at the bottom.) which is why I suggested that the player (and I forgot the mobs and stuff) grows as they move up and shrinks when moving down. Also, on a sphere blocks would have to get either smaller or fewer as you got closer to the poles. There are computer game worlds where the world is square or rectangular and still wraps around but the Minecraft worlds don't do that and that wouldn't work with the spherical shell model either. As long as you are within the accessible area in the Overworld (60,000,000 X 60,000,000 blocks (or whatever it is)) and the central 1/64 of the area of the Nether (7,500,000 X 7,500,000 blocks, 1/8 of the distance from the center in both the X and Z dimensions) then moving 8 blocks in the overworld is the equivalent of moving 1 block in the Nether when connecting portals. A portal at X=800, Z=1600 in the Overworld for instance will "look for" a portal at X=100, Z=200 in the Nether and vice versa. I still haven't bothered looking into what happens when you enter a portal outside the central area of the Nether though. Please forgive my irritation about the area/distance thing, I did understand what you meant. Though you're still talking about distances not areas, at least not in the geometric sense, you might get away with using area in the geographical sense. I don't think that using surface works for the Overworld since the Overworld has its own surface and underground. The size and accessibility of the world(s) has changed between the versions, I still have trouble considering it to be infinite, in some sense the world may be potentially infinite but I'd say that it's actual size is only as big as the chunks that have been loaded and are saved (or will be saved) on the hard disk. According to the Wiki you can get outside the barrier by using ender pearls, mounting a ride outside the barrier or dismounting next to it so I'd have to say that the accessible world is 60,000,000 X 60,000,000 even though you take damage outside the barrier except in creative or spectator mode. A serious problem with the idea that the Nether is physically below the Overworld is that with cheats enabled or in spectator and creative mode you can fly or teleport up well over 100,000 blocks above the Nether with no sign of the Overworld. The Nether and the Overworld are separate dimensions. You are not supposed to go above the bedrock layer. Unbreakable barrier for a reason. A couple of things: I ignored the actual heights of the Overworld and Nether because combined together they're less than a kilometer high. They might make a difference, though, however small it might be. I also got the idea of the Nether being below the Overworld from the advancement "We Need To Go Deeper"
It could be totally possible that they're in different planes of existence. This game has basically no lore so it's hard to say. But Spectator mode and Creative mode do exist as well as ways of glitching through the bedrock (even if they've made it a lot harder to actually break it without cheats in later versions) so it's hard to argue for ignoring the data one can collect from doing so. Yes, I've always had the idea that the Nether was assumed to be directly under the Overworld, with just 10 or layers of bedrock separating them, even though I understand that both the game mechanics and in game data (from breaking through the bedrock) contradict this. But in normal survival gameplay one can assume anything one wants to. There are lots of things I know about how the game works that aren't really worth worrying about or basing my gaming experience on, like the fact that in some sense the world is only "real" in an area out a bit further than the render distance around each player and everything else is packed away and stored on the hard disk and areas far enough away from the areas one has visited don't even exist on the hard disk, they are only generated if and when needed, sorta like a version of The Truman Show. And I just never worried about the portal ratio, I just accepted it for what it is. But it is interesting to think about it as if it were real.